FOR IMMEDIATE RELEASE, 11/30/15, 9:00 AM Eastern. Paper published in British Medical Journal contains significant factual errors. Oakley, CA – A new research paper from Stanford Research Into the Impact of Tobacco Advertising, published in the British Medical Journal, raises serious questions about the university’s use of research funds. The paper, authored by Stanford professor Dr. Robert Jackler, makes accusations of “brandalism” – manipulating an existing work to convey a different message, a tactic often used in anti-tobacco advertisements over the past two decades. In fact, the originator of the edited images is a graphic designer named Shawn Rego, who created the modification based on a poorly-worded CDC advertisement he felt was misleading the public. The ad, featuring a woman with a scar from surgery, implies that e-cigarettes were somehow responsible for a collapsed lung despite the clear statement that ‘Kristy’ continued use of combustible tobacco products. Ironically, Stanford’s paper makes note of the fact that identifying the author of a knock off advertisement may be challenging. 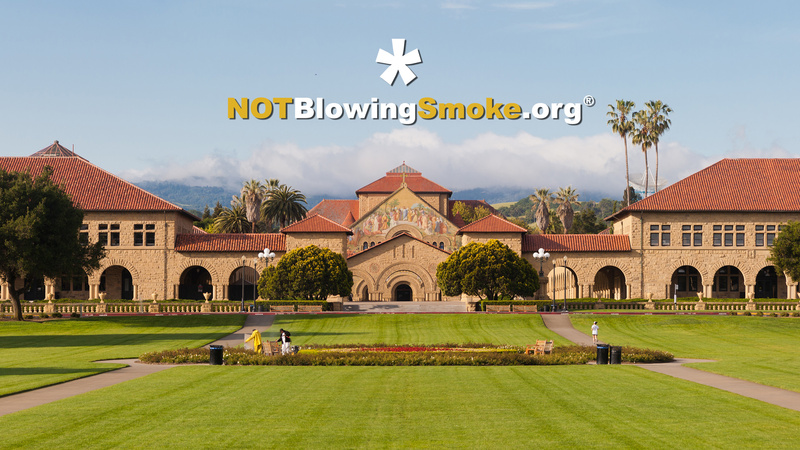 Not Blowing Smoke has sent formal letters in response to the research to Dr. Jackler as well as leadership at both Stanford and the British Medical Journal calling for a retraction. 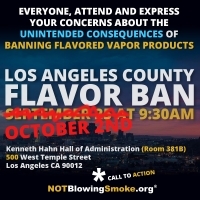 Not Blowing Smoke is a nonprofit corporation formed in response to the California Department of Health’s misleading anti-vaping campaign, which to date, has spent upwards of $15 million dollars of taxpayer money. The organization was founded in March 2015 by Stefan Didak, a nationally recognized consumer advocate for vapor products with assistance from Jason Downing. Shortly after founding, Danielle Bloss, a brand manager at Apollo, joined the team and the three now form the board of directors. 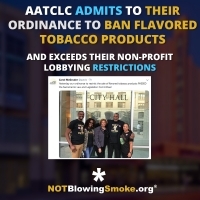 We are dedicated to providing the public and government officials with the truth about vaping. Not Blowing Smoke operates completely independent of industry influence, although we do receive limited funding from strategic partnerships. Stefan switched from smoking to vaping in 2012 and has been a vocal and active supporter and advocate for vapor products and tobacco harm reduction and is frequently seen testifying in front of state and local legislators and policy makers. Outside of Stefan’s legislative and PR efforts, including the creation of the #notblowingsmoke website and movement, he is mostly known for working out of the world’s most famous home office. Stefan has been featured in many articles and interviews on the subject of vapor products, electronic cigarettes, and harm reduction, including professor Stanton Glantz’ Tobacco Control blog at the University of California, San Francisco.